Sikaiana (pop. 750) is a Polynesian language in the Solomon Islands. 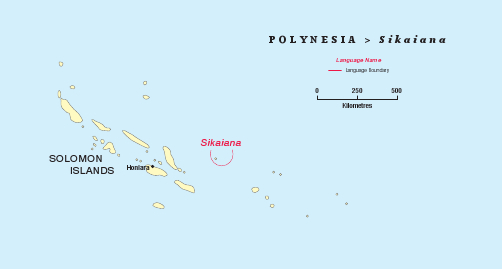 The language is closely related to Takuu in PNG, and a little less closely to the Ontong Java and Nukumanu languages in the Solomons and in PNG respectively. The population mostly belong to the Church of Melanesia. After a devastating cyclone in the 1980s it looked for a while that the island would no longer be able to sustain a viable community, but in recent years schools have been rebuilt, and there is renewed interest in the survival of the culture and language. A dictionary by Bill Donner exists. For many years it was thought that the language of Sikaiana was no longer viable, and that translating the Bible into this language was not necessary, since the majority of the people are living in Honiara where many of them use English or Pijin as the language in the home and at work. In 2005 Nico Daams was approached by the COM priest Father Henry Tupo with the request to assist the Sikaiana people to translate the Bible into their language. Fr. Henry then tried to find the right people to be involved in this project, but without success. In December 2011, however, Fr. Henry decided to take retirement and start translation work himself.